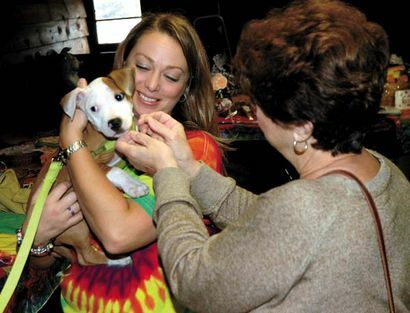 BROADALBIN – Tie-dye, peace signs and plenty of dogs could be seen on Saturday at the Regional Animal Shelter’s second annual “Woofstock” at Robin’s Nest. Robin Markert, president of the group, hosted the event at her restaurant to support the group’s plans to build a shelter facility. Many of those attending the event were people who have adopted dogs through the shelter organization. They were invited to bring their pets with them Saturday. Markert said the group was hoping to raise $3,000 to $5,000 at Saturday’s event. For several years, the group has been raising money to build a shelter on a 26-acre plot it owns on Maple Avenue in the town of Johnstown. The shelter group also runs a small animal facility at 117 W. Fulton St., which opened its doors last March. The facility was created under a public-private partnership involving a four-year lease agreement with the city, which was drawn up by the Common Council in 2011. The agreement lets the shelter lease kennel space to Gloversville for $1, and the city rents the building to the shelter for $1 per year. The facility includes eight kennels for dogs, and it has an enclosed outdoor space. Markert said construction on the Maple Avenue shelter is expected to begin soon. Casey Croucher can be reached at ccroucher@leaderherald.com.